In addition to our experience in the banking, brokerage, insurance, and mutual fund industries, Keane provides communications solutions for the shareowners of thousands of publicly traded corporations. Likewise, our experts provide compliance consulting and other escheatment services to a vast range of industries and have the experience to deliver customized solutions to reduce escheatment in virtually any situation. Below are examples of how unclaimed property variations across industry impact clients differently and create distinct unclaimed property challenges and solution requirements. Contact Us for Information on Escheatment Reporting in Your Industry. Colleges and universities, both large and small, public and private are not exempt from filing annual unclaimed property reports to the appropriate states. Educational institutions must understand the impact of unclaimed property laws on their organization and develop effective policies and procedures to manage the operational activities of escheatment, ensure compliance, and achieve measurable results. Colleges and universities of all sizes can’t afford to be out of compliance with state escheat laws. That’s why many institutions have enlisted Keane’s annual escheat reporting services to help ensure compliance with unclaimed property state laws. In addition to the rebate checks or prepaid gift card that are commonly offered with the purchase of a mobile phone or tablet, subscription refunds and credits are some of the most common forms of unclaimed property for mobile phone and internet service providers. Unclaimed rebates that are beyond their dormancy period must be reported to the individual state on an annual basis. Failure to comply may result in state-mandated penalties and interest, and could potentially lead to a full-blown audit or litigation. Given the traditionally high volume of utility refund checks and customer utility deposits, utility companies should place a high priority on monitoring the disbursements made for refunds and deposits. A proactive approach to reduce the unclaimed property risk in the utilities industry would be to ensure the consistent solicitation of customer addresses, especially a correct forwarding address upon account closure so whether the customer moves across the state or across the street, you’ll be able to property return refunds or deposits. A common risk in the current healthcare industry is the creation of credit balances by actions such as overpayments, misposted/unapplied payments, unused rebates, Medicare credits, wellness credits, and Health Savings Account (HSA) transfers. Although credit balances are often found in small amounts, the stakes are high. Most state escheat laws prohibit providers and other holders from taking credit balances into income. Failure to report credit balances on an annual basis may result in a multi-state audit and/or substantial fines and penalties. By far the biggest challenges to most retailers are gift cards, gift certificates, and stored value cards. Like any other form of escheatable property, gift cards have a dormancy period that must pass before unused balances are considered reportable. Additional sources of unclaimed property that also must be accounted for include customer refund checks, accounts payable, accounts receivable, and uncashed payroll checks. Some of the more common unclaimed property pitfalls in the transportation industry include unused balances from prepaid shipping accounts, uncashed refund checks from lost or damaged shipments, and credits from overpayment of international duties and taxes.  All three are considered forms of unclaimed property and must be reported based on the property type and each state’s dormancy rules surrounding each property type. Unclaimed property for non-profit organizations and charities is an often overlooked area, but financial professionals in this industry should still be mindful of common general ledger property that may become a liability if not addressed properly. This includes uncashed payroll checks, accounts receivable and credit memos. Additionally, there is the ability to recover escheated property on behalf of donors as a new avenue to increase or enhance donations and contributions through unclaimed assets.